BOCA RATON, Fla. -- The NHL has no objection to a request made by potential expansion franchise owner Bill Foley to conduct a season-ticket drive to gauge interest in the Las Vegas market, NHL commissioner Gary Bettman said Monday at the Board of Governors meeting. Bettman stressed that the governors' lack of objection in Foley conducting a season-ticket drive did not start the expansion clock on a franchise in Las Vegas. He also stressed that there was no formal vote on any matters related to expansion, including the season-ticket drive. "What I'm about to tell you requires a deep breath and a level of precision that I am requesting because I don't want it misunderstood," Bettman said. "We gave the Board an update on expressions of interest from cities and people interested in expansion teams. "There is no formal expansion process. There is no vote that was taken today. There is no vote that was contemplated. We don't have an agreement to sell anybody an expansion franchise. However, the interest that we are getting from Las Vegas has raised lots of questions about the market itself and the interest level in supporting a professional team in Las Vegas." Bettman said Foley has questions about the willingness and ability of the Las Vegas market to support an expansion team. Foley believes the results of a season-ticket drive will answer many of those questions. "Bill asked me last week what would be the possibility of them, knowing that they don't have a team, they don't have an expansion commitment, what would be our reaction to them conducting a season-ticket drive to measure the level of interest?" Bettman said. "And so that if there is interest there, he will continue to pursue that interest, and if it turns out that there isn't interest there, then he would stop his efforts and stop using valuable time and money in pursuit of a team if it didn't make sense." 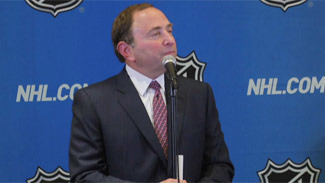 Commissioner Bettman said that Las Vegas was a unique market and it would be beneficial to have additional information about its appetite for an NHL franchise. He also stressed, however, that nothing but permission from the Board was gained Monday. "The terms of what it would look like, namely the season-ticket drive, we haven't figured out yet," Bettman said. "We would have to discuss. The fact is, if they get it - 'get it' meaning sufficient [ticket] interest -- it doesn't mean we wouldn't then have to reach an agreement and go through an expansion process, and the Board would have to decide whether or not it even wants to expand. "The sole purpose here would be to give, in this unique circumstance, Mr. Foley and his colleagues an opportunity to measure the level of interest in the market by conducting a season-ticket drive, and that's something that I intend to tell him that we have to objection to him doing as long as we understand the parameters of it." Regardless of the story the data tells, a next step has not yet been determined, according to Commissioner Bettman. "Obviously [if] the market is as strong as some people believe, obviously Mr. Foley will continue to be interested and we'll have to figure it out from there. It may be that we're in the same position we're in now, but he'll hang in there until whatever point we decide we want to do an expansion. And it may be that the Board decides they still don't want to expand at all. "All it's doing is letting him measure for his interest and ours whether or not the market will support a team, at least from that measure alone. It's not any bigger deal than I just announced." Also Monday, Commissioner Bettman provided the teams with an initial projection for the salary cap during the 2015-16 season; he says, barring unforeseen circumstances, the cap will be about $73 million. "I went over a series of projections, preliminary, preliminary projections," Bettman said. "Estimates that are not carved in stone, but our best guess based on the information available making lots of lots of assumptions on things like revenue growth in the year and perhaps as significantly, what may happen with the Canadian dollar. "Our best guess, and it's got some variation in it, that if the Canadian dollar stays where it is now for the rest of the season, which is about 88 cents (on the American dollar), the cap for next season would be approximately $73 million. It's just a guess and it is subject to variation."